The mute swan, introduced to the United States from Europe, is the typical swan that comes to most people's minds these creatures come up in poetry, fairy stories, ballet and casual conversation -- the graceful white ones with black masks. Six to eight swan species exist. 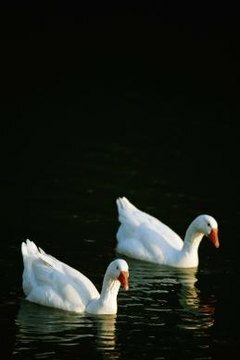 With their geese and duck relatives, swans belong to the group of larger flying birds in family Anatidae. In general, swans are long-lived birds who mate for life from the age of 4 or 5. Swans live for approximately 20 to 30 years. Some variations exist between the more common swan species. The trumpeter swan, which is the largest swan in North America, lives for an average of 24 years in the wild but has been known to live for 33 years in captivity. A mute swan lives for an average of 19 to 20 years; the tundra swan has a similar life span. The black swans of Australia and New Zealand, which have been introduced to North America and Europe, can live for up to 40 years in the wild.